While Gai and I were based in Bellac in the Haute-Vienne region of Western France, it put us near the town of Oradour-sur-Glane. What was so special about this town? It is a catastrophic scene frozen in time. Oradour-sur-Glane is an entire town comprehensively destroyed by the Germans during the occupation of France in World War II. It is the location of a brutal mass murder that included women and children. Reading the first 100 words of the story back to myself, it sounds simply horrifying. Yes, it is. However, the entire town of Oradour-sur-Glane is preserved as a museum as a tribute to honour those townsfolk who perished. It happened on June 10, 1944. According to a variety of reports, soldiers of the Der Führer Regiment of the 2nd Waffen-SS Panzer Division, Das Reich, charged into the French town and simply killed a total of 642 men, women and children. The men were separated and held in another part of town while all the women and children were herded into the town’s chapel. The chapel was then maliciously set on fire. As the prisoners tried to escape from the burning building, they were callously strafed by machine gun fire and dropped on the spot. The others inside perished in the fire. Meanwhile in another part of town, the men were lined up and systematically gunned down by automatic weapons. In another cruel twist, the entire town was set on fire by flame thrower. Almost nothing survived. There were only a few unitended survivors; a couple of children and several men reportedly escaped by crawling into a system of rabbit hutches and slipping through the cordon of soldiers, making it to safety. Why did this happen with such unrelenting force and veracity? The cruelest part of this story that the officers at the time believed the townsfolk had captured an SS officer and were torturing him. However, it turns out the Germans had the wrong town! 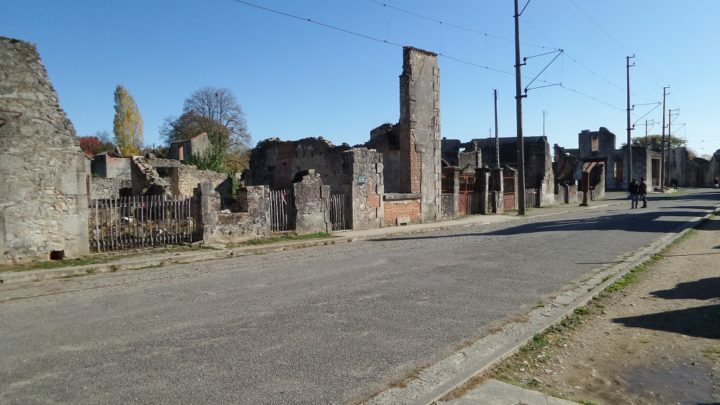 When you visit Oradour-sur-Glane, you enter through a large facility that has all the usual amenities of a major tourist attraction. Walking through this facility, it spills out to a walled town. Like many of the other visitors who did not know what to expect, Gai and I were stunned by what we saw. It is an apocalyptic vision. Everything is destroyed. In street after street you see houses levelled and strewn with rubble. It appears as though a huge bomb hit the town. There are sad remnants to be observed at many of the residences and businesses. The only things that are left are metal objects like the odd sewing machine and burned out cars. There is one car, an old Peugeot model, that is reported the most photographed car in all of France. 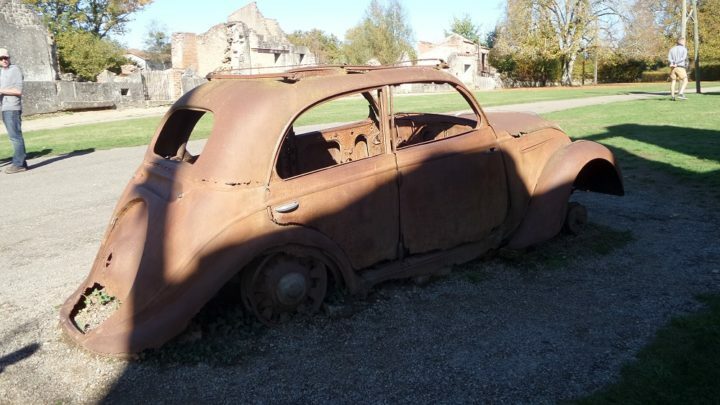 It belonged to a doctor who had arrived back at Oradour-sur-Glane after visiting a patient, just as the residents were being assembled. As you walk along the various streets, you notice the tram tracks that wind through the gently hilly streets. There is a commentary available in both English and French. The overall feeling both Gai and I experienced was one of utter sadness. What really got to us is how the women and children were dealt with. It would have been a horrible way to die. Bundled into the chapel and locked in there as the entire building was set on fire. Then gunned down as many of them tried to break out to escape the smoke and flames. It was cruelty on a massive scale. After the war there was a trial conducted in Bordeaux in 1953. It included the surviving men of the Waffen-SS and an explanation of why this event happened. Again, it confirmed the location was a mistake by the Germans. They got the wrong town. Do Gai and I recommend you go and see this for yourself if you are in the region of the Haute-Vienne? Yes. If only to grasp the atrocity that happened there during the German occupation of France in World War II. It is difficult to understand what drove this group to destroy Oradour-sur-Glane in such a heinous and ruthless fashion. The French Government has done an excellent job preserving the entire town. It is set up as a tribute to those 642 victims. It also allows a living insight into the tragedy of war. Not your usual happy slice of history in France, but worth a visit if you are close by on your travels! 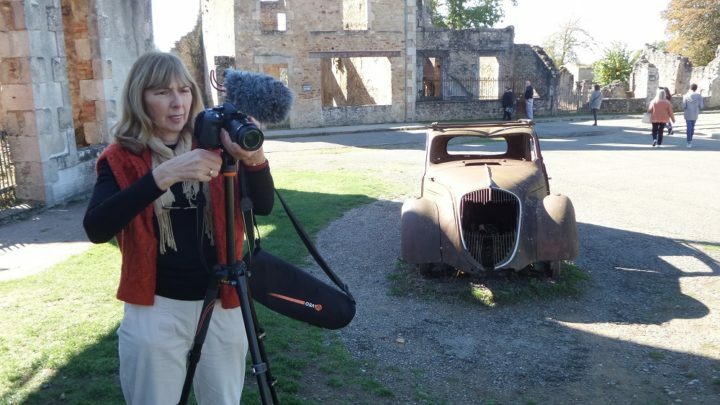 Had you heard about Oradour-sur-Glane in France? Have you visited any other war time locations in your travels?